Yes, another dumpling recipe. This comfort soup is one of our favorite soups to go to when it is miserable outside. It is too bad that many people would never give a second look at anything that has a liver in it. I use very fresh calf or baby beef liver for these dumplings and you can’t detect any liver taste or smell at all. 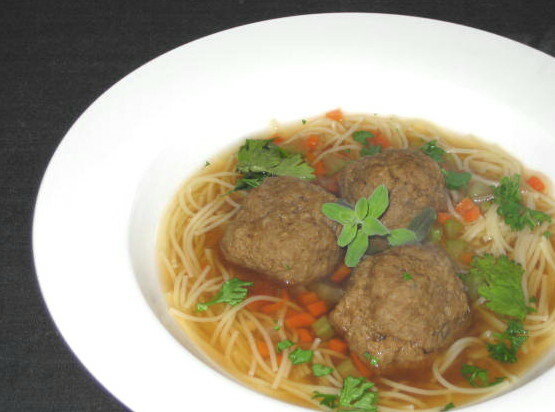 As is the case with most soups you can easily control how substantial the soup is just by modifying ratio of stock to solids, in this case number and size of dumplings and amount of egg noodles and vegetables. Remove all traces of membrane on liver, roughly chop and then run through grinder or food processor to make a coarse paste. Remove to mixing bowl and add beaten egg, milk, salt, pepper, baking powder and marjoram and mix till well combined. You will now have fairly thin batter. Add 1/2 cup of bread crumbs with flour, mix well and let it rest for 10 minutes or so for bread crumbs to absorb moisture from liver mixture. Remix and add adjust with more bread crumbs or milk until you can form a ball. Form walnut size balls and set aside. To make soup pour in stock into a soup pot, drop in all chopped vegetables and bring to boil. Cook for 5 minutes and then drop in all liver dumplings, being careful not to splash hot stock. Gently lift dumplings with spatula from bottom so they don’t stick. When all of them are floating on top, cover and simmer for 5 minutes. Add fine noodles and stir to prevent noodles from sticking together. Cook additional 5 minutes, add marjoram, taste and adjust seasoning. Serve with chopped parsley sprinkled on top.